Welcome to Munnar- the gem of God’s own country-Kerala. It is South India’s largest tea-growing region, so once you set foot on its lovely terrain, you will be greeted with emerald tea-green plantations on lustrous rolling hills. The best part of Kerala tour is Munnar, it is a picturesque piece of land, always fresh and welcoming. In the Munnar tour package enjoy the backwaters, scenery and different places for 21hrs in Kerala Style House boats from 12Noon in the houseboat you will be greeted with welcome drink, tea, snacks, mineral water, lunch, dinner and breakfast overnight stay in the houseboat. Relish your Kerala breakfast, Checkout of the houseboat at 9.00 am and transfer to Cochin Airport / Ernakulam Railway station with ever lasting memories of a holiday you will never forgets. Upon arrival for Munnar Alleppey Tour our representative will greet you at Kochi Airport. 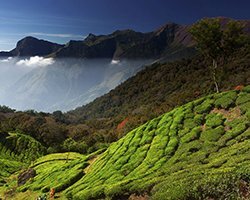 Later proceed to Munnar, This small town in the Western Ghats is famous for its picture book towns, sprawling tea gardens, mist clad hills, sanctuaries and above all the climate is one of the most sought after tourist destination in India today. Munnar is the gateway of Hills in South India.On the way you can also watch the lovely waterfalls of Cheeyappara & Valara and later Reach & check in at the hotel and relax for a while amidst the comforts of your room. Explore the rest of the day along with the nature. Overnight stay at the Hotel/Resort. Check out of the hotel from Munnar by 8.00am and proceed to Alleppey to check in to the Houseboat for a 20 hour long cruise through the world famous backwaters of Kerala. Houseboat (Kettuvalloms) is a indigenously developed and designed private boat with fully furnished spacious bath attached bed rooms, hygiene kitchen ,dining area and private front deck to capture the beauty of the back waters. The cruise through palm fringed narrow canals, the unique life of the backwater people and above all the nature around you will make long lasting impressions in your mind. Overnight stay in a houseboat. Relish your Kerala breakfast, Checkout of the houseboat at 9.00 am and transfer to Cochin Airport / Ernakulam Railway station with ever lasting memories of a holiday you will never forgets. End of services.